Cigarette contains over four thousand chemical compounds which have been shown to be capable of causing cancer. According to the World Health Organisation, tobacco plays a role in the development of about 16% of all cases of heart and lung diseases, and cancers of different parts of the body; and smoking is the single largest preventable cause of many diseases and premature death in people. While the greatest health danger is faced by those who smoke, people who are constantly in the same environment with smokers are at risk of developing some of the illnesses caused by cigarette smoking even if they don’t smoke. 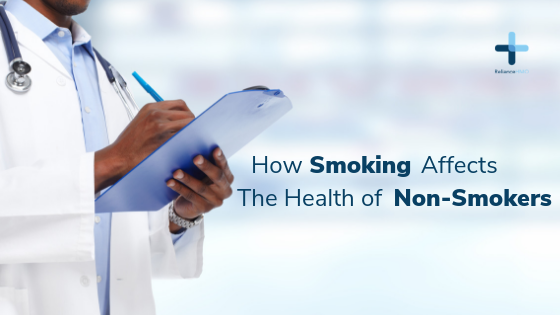 Children or adults who are nonsmokers but live with parents, guardians, relatives or friends who constantly smoke in the house can be called passive or secondhand smokers because they are constantly exposed to the tobacco. Children whose parents or guardians constantly smoke around them in the house or car are more likely to have irritations along their respiratory tract, leading to symptoms like cough and difficulty with breathing. These children have a higher risk of developing pneumonia, and those with asthma are prone to having what doctors call an acute exacerbation (asthma attack) due to constant exposure to tobacco smoke from smokers in their environment. Children who are not asthmatic are prone to developing asthma if they live in an environment where smoking is very common. Adult nonsmokers who constantly inhale tobacco smoke from smokers have an increased risk of developing lung cancer. In addition, children growing up in a house where either or both parents smoke are more likely to start smoking, even before they turn 18, meaning such children are prone to developing any of the heart or lung diseases and cancers associated with smoking and are likely to die young. According to the World Health Organisation, about 7 million people die every year from tobacco use and this number will increase in ten years’ time if people continue smoking. Today is World No Tobacco Day and this year’s theme is “Tobacco–a threat to development”. The most effective way to prevent the health implications of tobacco is to quit smoking or encourage those, including friends and colleagues, who smoke to quit. Quitting smoking not only cuts down the risk of developing the associated diseases in the smokers, it also lowers the health risks smoking poses to nonsmokers (especially children) who are exposed. Previous Post Previous post: What you should know about urinary incontinence.